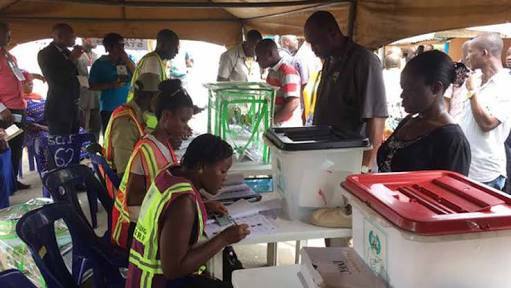 The Independent National Electoral Commission (INEC) says only the votes of the people of Osun will determine the next governor of the state. Solomon Soyebi, chairman, information and voter education committee of INEC, said this in a statement on Sunday. Declaring the election inconclusive has led to outrage. Joseph Fuwape, returning officer of the election, had said there was no significant votes to declare a winner. Ademola Adeleke, candidate of the Peoples Democratic Party (PDP), had polled 254,699 ahead of Gboyega Oyetola of the All Progressives Congress (APC) who had 254,345 votes. Afuwape said since the number of cancelled votes, 3,498, exceeded the difference between the two leading parties (353), no winner could be declared in the first ballot. Soyebi, while commending the Osun people, noted that the poll has been one of the keenly contested election in recent times. “Notwithstanding the successful conduct of the elections, the returning officer, professor Joseph Adeola Fuwape, vice-chancellor of the Federal Umversrty of Technology, Akure, has communicated to the commission his inability to make a return in accordance With the legal framework and INEC guidelines,” the statement read. “This is as a result of areas where results were cancelled there was no voting or there were disruptions..."